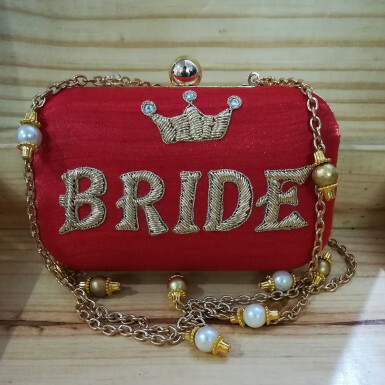 Winni presents you a beautiful red color bridal clutch, embellished with sparkling golden sequins, with BRIDE written on it. The clutch is styled with a versatile sling giving it a sleek and classy appearance. It will add instant oomph to your bridal look. It can also be a perfect gift for the one who is soon to be a bride. Order this lovely clutch from us right now.